Asha is couture wedding photographer based between Tampa and Orlando, but she will totally do a happy dance if you ask her to travel. Why you should consider a first look. As I’ve said before, your wedding day is going to feel like a whirlwind. But even though you are expecting it, you won’t fully understand what this means until the DJ announces last call, the lights come up, and you’re left standing in the middle of the dance floor wondering where the night went. If you find yourself asking, “Should I do a first look?” or even, “What is a first look?” This post is for you! A FIRST LOOK is where the groom is set up in a nice, quiet location before the ceremony. The brides walks up behind him and taps him on the shoulder while the photographer captures their reactions and those first moments together on your wedding day. A first look is something you and your fiancé should discuss to determine if it is right for you. This is your wedding. Not your mother’s, not your grandma’s, and certainly not mine. So I would NEVER try to push a couple into having a first look, but I do think it is important to have all the information before deciding what is right for you. After photographing hundreds of weddings, I know how important it is to see your fiancé’s reaction when he first sees you in your wedding dress. Even the most calm, collected groom will get nervous on his wedding day. The tension has been building since he started getting ready and how he is standing in front of 60-300 of his closest friends and family. He can’t help but think of them all watching him, waiting for his reaction, even as he sees you. And when you first see him, from the end of an often very long aisle, you won’t be able to talk, hug or kiss. You have to wait until the end of the ceremony for that. Even after the ceremony, it can be difficult to have a moment alone together as all of your guest rush over excited to see you. You’ve just finished getting ready. Your groom has spent the morning with his closest buddies. Hanging out, having a drink, maybe half watching a game on tv as they got dressed. He hasn’t had the chance to even think about getting nervous yet. Meanwhile, we’ve found a gorgeous, quiet area outside your venue and set him up with his back facing your entrance. And then we tell him his beautiful bride is just behind him. Here she comes. We’ve stepped back to give you your space and it is just the two of you. You walk up behind him, tap him on the shoulder and he just loses it. He wraps you up in the biggest embrace and kisses you. You both cry together and you’ve completely forgotten we’re even there. You twirl a couple times and ask what he thinks of the dress and you kiss again. He can tell you how beautiful you look and you can say how much you love him. For as long as you like, because there’s no rush. No guests waiting. No coordinator telling us dinner is waiting. He isn’t worried about everyone watching, or his friends teasing him later. You can truly be lost in this magical moment. You will have more time together, alone! And now, the nerves are gone. The anxiety is gone. Because you get to spend the rest of the day with the person that makes you feel the most calm. Eventually, you look around, blinking as if you were in a daze. You remember you were being photographed, but the smiles on your faces cannot be contained. After this, we move on to the portraits of the two of you. This means you get even more time together! Which equals more photos! More time to cuddle, more time to kiss, more time to soak it all in. This is the way you’ve been waiting for, planning, dreaming of. This is your time to be together, alone. And then we bring out your families and friends. We are able to move quickly through your family photos, because everyone is already gathered. They are all waiting for the ceremony to begin. After the family photos are done, we move on to your bridal party. Photos of you, your groom and your closest friends celebrating your wedding day. There will be plenty of time for you to have some fun with them! Finishing all of the photos BEFORE the ceremony means you will be able to actually join your cocktail hour, enjoy the tasty treats you picked out, and spend more time with your guests. Or you can use that time to be alone with your new spouse and really take in the whole day. Once upon a time I was married. On my own wedding day, the first time I was alone with my husband or even in a room with less than 10 people, was when we got in the car to leave. To me, that is heart breaking. This is the day you’ve been dreaming of since long before he ever popped the question. This is the day you marry your best friend. Wouldn’t it be lovely to spend as much time together as possible? If you choose to see each other before the ceremony, you gain so much extra time together to share even more laughs, exchange even more kisses, and make even more memories. Your day will feel longer and MORE relaxed, because you weren’t feeling rushed. You are investing a lot into your wedding photography. Doing a first look gives you a lot more time to get all the photos and capture all the moments you want. 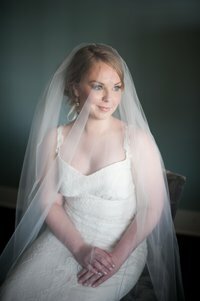 A First look allows the day to feel more relaxed instead of rushed for the ceremony and then rushing through the portraits to get to the reception because you have hungry guests waiting. There is ONE thing I will try to convince you to do on your wedding day. Whether you opt to do a first look or stand by tradition, find time to slow down, to be alone, to take in everything that is happening and the monumental importance of the day. Pause for a moment when you reach the end of the aisle to squeal “We did it!”, steal a few minutes to be alone before cocktail hour ends or slip away from the reception to take it all in. This is your day. Make the most of it. Alexis and Justin make me swoon. If you’re still worried that a first look will ruin your groom’s reaction when they open the double doors and he sees your at the end of the aisle, moments away from becoming his wife, I want to introduce you to Justin and Alexis. Justin is one of the sweetest grooms I have ever had the pleasure of working with. And honestly, their pictures need no words, because his reaction both during the first look and watching Alexis walk down the aisle is honest and heartwarming, and really quite beautiful. But seriously, look at that face! Have you ever seen anything more touching!